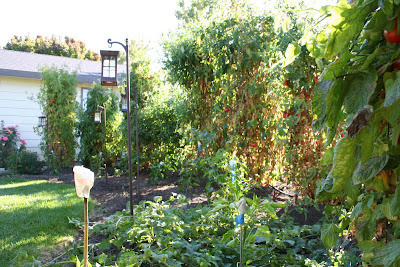 We delight in Gordy's Garden. Gordy and his wife live two houses down from ours. Gordy is an amazing Gardener and plants the most amazing garden each year. Our family waits to watch the tomato plants grow far above the six foot fence and the children love having a pepper plant of their own in Gordy's Garden. 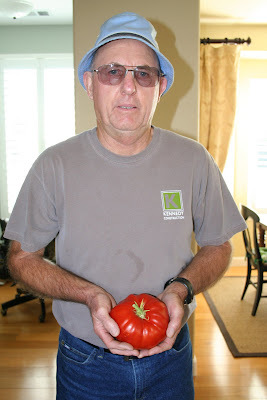 Gordy, each year, plants enough pepper plants in his garden for each child in the court. The kids then make homemade sticks with their names on them and they pick their pepper plant. Gordy keeps a watering can by each pepper plant and the children can come visit the garden and water their plants when time allows. They also visit the garden to pick fresh ripe strawberries, yellow and orange cherry tomatoes and to just hang out with Mr. Gordy. 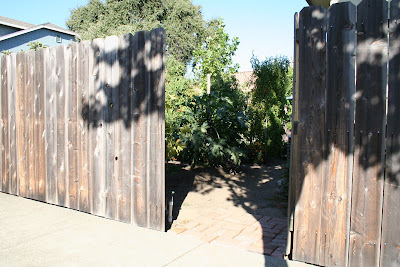 When Gordy's side gate is opened...the garden is opened. This is Gordy and his garden. 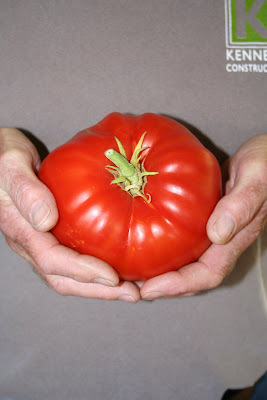 Today Gordy came by to show me his "giant" tomato he grew for his contest he has with his friends. It weighs a whopping 1 and 3/4 pounds! Good luck Gordy. 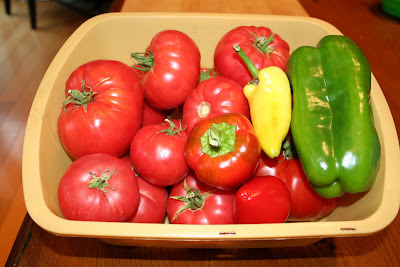 Here is what we typically get from Gordy's Garden and what we typically make and eat with our dinner or for a snack. Last night we made whole wheat pizzas. 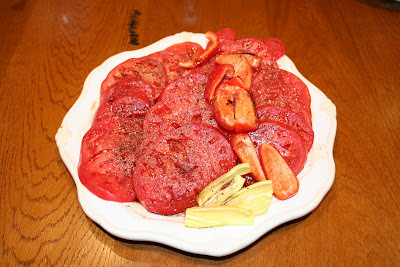 I put tomatoes and peppers from Gordy's Garden and red onion and garlic on mine. Friday, Stephanie and I are making her famous Tomato Soup with Gordy's Famous Tomatoes! 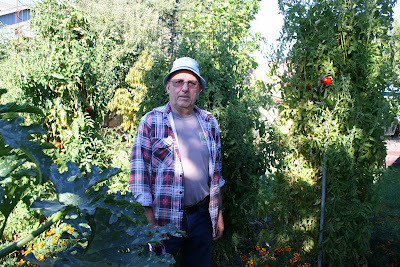 Thank You, Gordy for working so hard in your garden, for sharing your garden and helping us keep with the PLAN. yummy all looks so good! Will Gordy share with anyone outside of your court, ie. me? Does he grow zuccini? If so, will he share if I promise to make him some zuccini bread? I'm dying for some right now, and it's the best when the zuccini are fresh from a garden. (I think I've spelled zuccini wrong this entire time, oh well).